Seeing as how there aren't that many gib mods, I figured something could be done about it. Thread is no longer maintained! For reporting bugs, discussing the mod, or contacting me in general, you could join this Discord. NOTE: To load the mod after downloading, add the .zip file to your load order. No need to unpack. It's a bit less resource-intensive than Ketchup. Mostly because it doesn't spam actors and models. Still, it may lag. Since it doesn't spawn blood actors, crushers don't halt the map to a freeze. If you like the gibbing in Quake 3 and/or Blood 2, this definitely comes close to those. At the very least to the latter. It's highly customizable. Trail thickness, explosion velocity, toggling of floor decals, you name it; it can be adjusted. It uses particles, so it's entirely possible to have that blocky blood. But wait, there's more! It can also use vanilla blood, making it fully compatible with mods such as Droplets, and even Ketchup! Most of the work I'll do myself. However, I need to know one thing, and I need the information to be absolutely precise: I need the name of every preset option and its value. MISSING options will be considered UNTOUCHED and therefore will NOT be affected by the preset. Use labels from the menu so things don't get confusing! Spoiler: Videos. Caution: may contain outdated material! Q: Is this compatible with other PWADs? Q: Is this compatible with other IWADs? 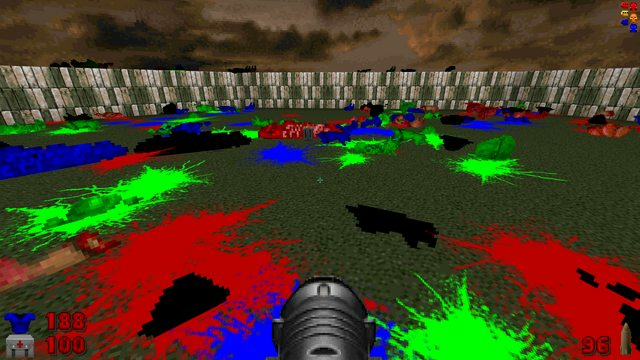 Q: IS DIS COMPATIBIEL WIHT BRUTAL DOOM!?! A: Funnily enough, yes. It actually is. Q: Does this feature new blood? A: No. That is beyond the scope of the mod. Q: Where are the credits? - Actors with black blood will spawn red blood. Not aware of any possible fixes. 020202 for blood color works fine, though. - Monsters that don't end their death state with a -1 frame duration won't be able to have their corpses gibbed. - Gibbable monster corpses will spawn red blood, regardless of the blood color of the monster itself. Cannot be fixed. Last edited by Lud on Thu Mar 14, 2019 2:01 pm, edited 36 times in total. A video I whipped up real quick to showcase the mod. You can even see the debug stuff. Don't let the explosiveness scare you. It's adjustable. Finally you can have ludicrous gibs in any TC. I'll have to check this out. - Fixed a critical issue where gibbing Keens would not activate their special. - Updated OP with a rundown of sorts and necessary GZDoom version. From looking at the code, I'm assuming that this does not respect different blood colors? Nope. It doesn't. I reckon it could easily be made to respect them, but red gibs/floor decals with green blood trails would look really off. Initially I did experiment with customisable blood/gibs color, but that didn't work out as expected, so it got scrapped. The big problem is in the translations. I'll try messing with it later on my own to see if I can get blood colors to apply. I believe using the flags SXF_USEBLOODCOLOR and SXF_TRANSFERTRANSLATION in the right way can make it work. There are no issues with translations on flat sprites, are there? So, I finally got some free time to experiment with this, and I have a 50% working method for differently colored blood. BLDSA0 needs to be an alpha map, and the bloodsplats should have RenderStyle "Shaded", so they behave like decals. Before any gibs are spawned, set the StencilColor (via SetShade) of the dying monster to its BloodColor. All gibs are spawned with the flags SXF_TRANSFERSTENCILCOL and SXF_USEBLOODCOLOR. This flawlessly recolors the gibs and stores the stencil color, which won't affect the gibs' appearance. When the gibs spawn a blood splat, it again uses the flag SXF_TRANSFERSTENCILCOL to pass on the color. This affects the floor splats and colors them correctly. Unfortunately, I've run into some problems with this method. When no BloodColor is specified, e.g. every single vanilla actor, gibs are untouched (which is good) but splats are black (obviously less good). I can change black splats to red but this means actors with actually black blood will have red FX. I have absolutely no idea how to properly color the particles! I can't seem to set the particles' color to the StencilColor. I can set it to BloodColor, but since the BloodColor isn't passed down this does nothing for me. Using the color unaltered makes it cartoonishly bright. This can easily be fixed so it's not a huge issue. Here's a version I quickly modified if you want to poke around in it. I'm very unfamiliar with ZScript so I could be doing something horribly wrong. Summon "test1", "test2", or "test3" for zombiemen with green, blue, and black blood respectively. Removed, no longer necessary. Last edited by RiboNucleic Asshat on Mon Jan 29, 2018 8:11 pm, edited 1 time in total. Well, I've found an annoying bug. If you're playing this with Legendoom, any Legendary monsters (the ones with a red glow) that are killed via gibbing will not drop a Legendary Weapon. You'll need to kill them normally to get a weapon drop. - If enabled, blood now respects the bloodcolor property of the gibbed actor. PermaNoob wrote: When no BloodColor is specified, e.g. every single vanilla actor, gibs are untouched (which is good) but splats are black (obviously less good). I can change black splats to red but this means actors with actually black blood will have red FX. Forced red blood on black-blooded actors. Can't win 'em all. PermaNoob wrote: I have absolutely no idea how to properly color the particles! I can't seem to set the particles' color to the StencilColor. I can set it to BloodColor, but since the BloodColor isn't passed down this does nothing for me. StencilColor is actually fillcolor. This has been addressed and fixed. PermaNoob wrote: Using the color unaltered makes it cartoonishly bright. This can easily be fixed so it's not a huge issue. Overall jolly well done! Thank you. Cryomundus wrote: Well, I've found an annoying bug. If you're playing this with Legendoom, any Legendary monsters (the ones with a red glow) that are killed via gibbing will not drop a Legendary Weapon. You'll need to kill them normally to get a weapon drop. Damn, I doubt anything would come out of this due to how LegenDoom handles all the item drops. I'll investigate, but the estimated chances of nothing happening are about 99%. Dang! This is satisfying Blood and Smooth Gibbing! i will enjoy this more. thanks. I tested it with Bloodfixer (which is fixing the blood color of the enemies), the experiment worked. - Fixed issue where ACS scripts would not get called/finish upon destroying an actor, thus breaking mods and maps. You rolled a 20! Managed to fix the LegenDoom issue. Wasn't as hacky as I expected it to be. Quick update with a few things. - Changed gib calculation formula. - Setting threshold to 0 will always gib enemies with the maximum overkill level. - Gibs no longer teleport. EDIT: Critical issue with the LegenDoom fix. Game will crash if Archvile attempts to resurrect a gibbed enemy. Trying to fix this atm. Fixed. Sweet! This works wonderfully now. Ketchup is essentially 100% obsolete for me at last, thank god. Lud wrote: StencilColor is actually fillcolor. This has been addressed and fixed. Huh, I didn't know that. The wiki isn't too clear on how that works and I haven't even touched DECORATE let alone ZScript in a few years, so I got confused.